The following are proper procedures and duties of a junior referee. These rules and guidelines are for USAV Domestic Competition Regulations 2011-2013 Indoor. There are 4 main areas of concentration. Develop skills in these areas and become a great second referee or down ref. Be at the court 15 minutes prior to the start of the match. Have your whistle. Be sure to bring a whistle with you to each tournament where you'll be required to be a second junior referee. Sometimes whistles are sold at tournaments, but not always. It's not the R1's job to supply whistles to all junior second referees. If you play a match on the court previous to being a second referee, you should let the official know ahead of time that you'll be right back after your game. Ensure that scorers and line judges are present. When arriving at the court, make sure all your teammates that are part of the work crew are present and ready to work the match. Check for the score sheet, line up sheets, and Libero tracking sheet. If the proper paperwork isn't' at the table, let the first referee know. Introduce yourself to the first referee. He or she will discuss what is expected of you as a second junior referee. Be part of the captains meeting. You are a key member of the work team and you should be in attendance to hear who serves first and what bench each team will occupy. Inform the scorer which team has serve and which bench each team will occupy. Make sure the scorer fills out all aspects of the score sheet and records the "X" in the first round service box of the receiving team. If necessary, assist the scorer in filling out the score sheet. Start the match by walking out with the team on your right. Start on the right side of the net with the team on your right. The other team will be on the other side of the net. At the first referee signal, you will walk out to the center of the court and then turn to face the benches. The teams wave to their fans, the junior referee and other officials don't wave. When the first referee whistles for players to shake hands at the net, you should move backwards towards the first referee stand. Once teams shake hands, shake hands with the first referee then move over to the scorer table to begin your duties. After teams have taken the court, check the line ups for both teams. Let the first referee know who the captains are and then toss the ball to the first server for the start of the match. Before you give the court to the R1, make sure that the scorers are ready and then get on the receiving team's side and give the R1 the ready signal. During play, move to the blockers side of the net. 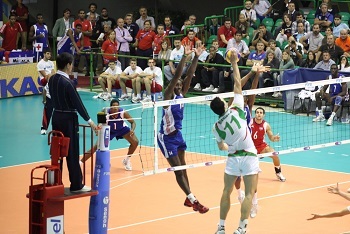 To do this, wait until the play is away from the net and move to the blockers side. 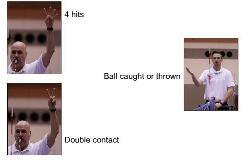 This will ensure that you are in the best position possible to judge net contact and centerline violations. At the end of each rally, mimic the R1's hand signals. Check with scorer and make sure all is well and that the correct score is displayed. If there is a wrong server during the match, the scorer should inform you and after the ball has been contacted for serve, you should whistle and indicate to the first referee that the wrong server contacted the ball. Both you and the scorer will then check to make sure that the players are in the correct position before the next serve. If at any point during the match a player, coach or parent begins to heckle you, inform the first referee of this behavior. This isn't appropriate and the first referee will immediately address this behavior. When one team has reached 24 points, let the R1 know it's set point by putting your pointer finger on the shoulder of the team that has set point. Check the score sheet for accuracy. Make sure the scores are entered correctly and the right team won the match. Return the game ball to the scores table. Thank your teammates for a job well done. Thank the R1 for a good job. The second official is responsible for performing various officiating techniques.